Until recently, their play involved Brandon pushing Jake’s wheelchair around the track or sitting together on the lawn with toys. But on this day Jake is smiling as Brandon spins him around on a merry-go-round shaped like a bowl to keep occupants inside. Nearby, a horizontal slide allows those without use of their legs to pull themselves across rollers. Another apparatus allows special-needs students to pull levers that make electronic sounds of a piano, bells and more. 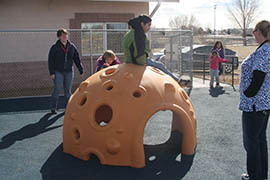 A hard plastic dome with holes allows students to climb without negotiating metal bars – or to play inside. Brandon, a fifth-grader, said the inclusive playground that Mountain View opened in December has created opportunities for Jake, a fourth-grader, and other students for whom traditional play equipment isn’t an option. 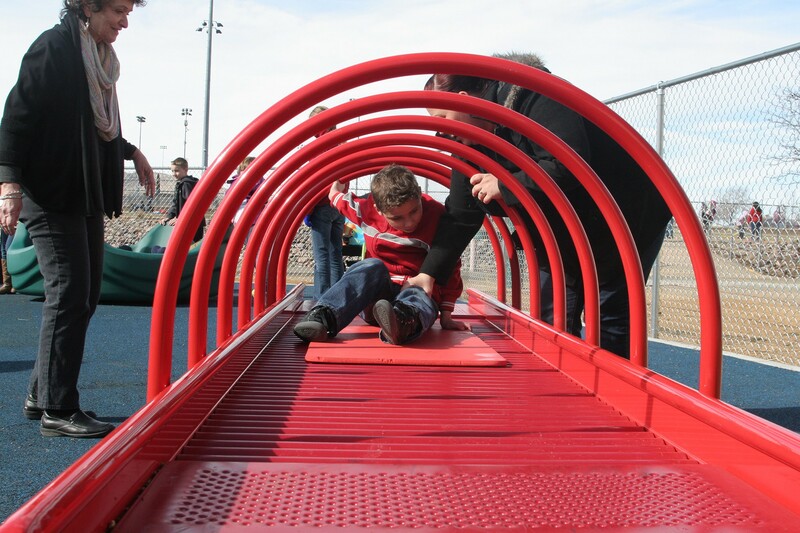 The playground, built with a $55,000 grant, is the brainchild of special education teacher Joann Hayden, who said she learned about inclusive playgrounds while listening to National Public Radio. “I thought, ‘Why not at Mountain View?’” Hayden said. Steve Reynolds, a volunteer at the school and husband of one of the teachers, connected Mountain View with the Arizona Community Foundation of Yavapai County, which approved the grant. A ribbon-cutting ceremony in December had to be held inside because of rain. “The ceremony brought tears to some folks’ eyes,” Reynolds said. 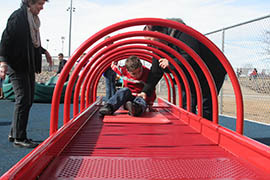 Mountain View’s inclusive playground is one of at least six in Arizona, according to the website accessibleplayground.net. It joins a growing number around the country, said Mara Kaplan, founder of Let Kids Play, a Pittsburgh-based consulting firm focusing on inclusive play. The most expensive part of an inclusive playground isn’t the equipment but the play surface, which must be soft synthetic tile to cushion falls, Kaplan said. The playground isn’t finished. The school plans to add two or three more apparatuses and finish surfacing the whole playground. But for Brandon and Jake, the equipment has already created a drastic change. “You can do special things with them,” Brandon said. Cronkite News reporter Mackenzie Scott visited Mountain View Elementary School and found out where the inclusive playground idea was sparked. 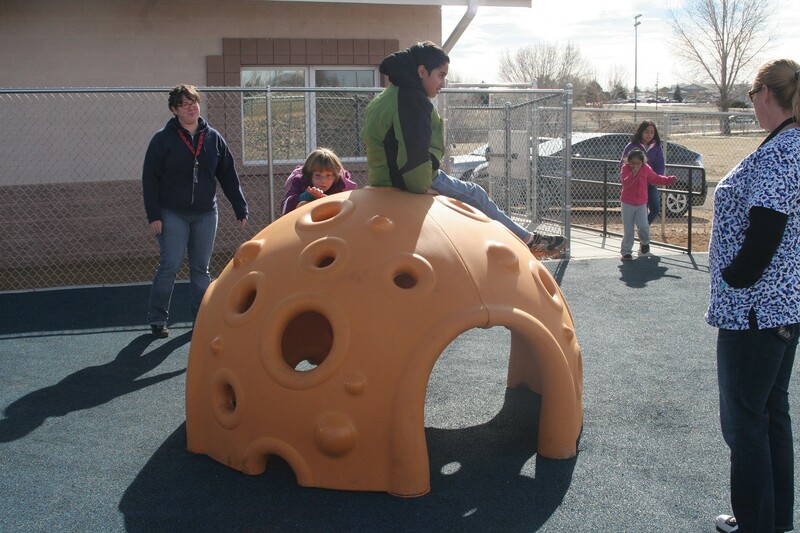 The hard shell and holes on this inclusive playground structure allow students who may have difficulty grabbing bars on traditional equipment to climb on top or play inside. 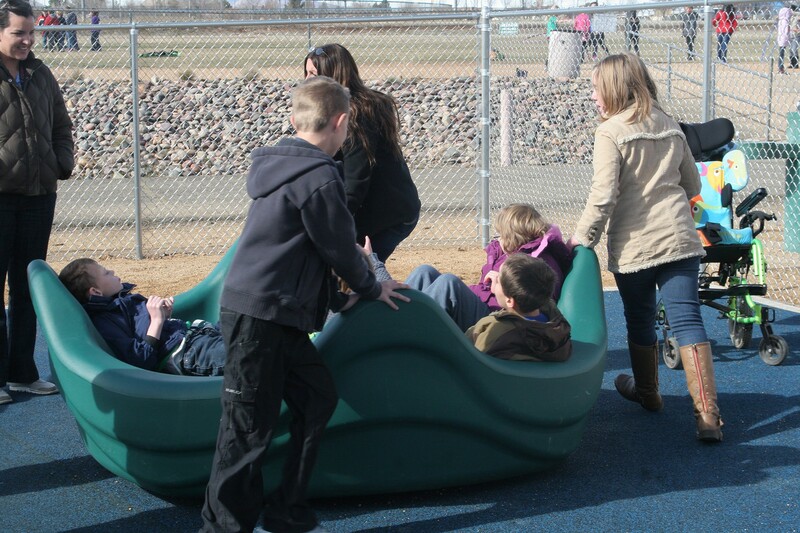 A bowl-shaped merry-go-round allows students to ride without holding on at a new inclusive playground at Mountain View Elementary School in Prescott Valley. 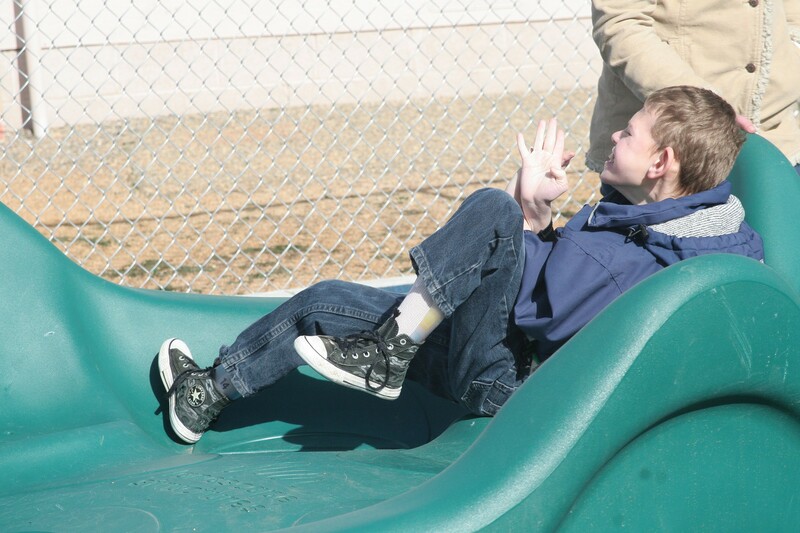 Charles Coleman, a fifth-grader at Mountain View Elementary School in Prescott Valley, uses a slide that allows students to pull themselves through with their arms. Jake Fite, a fourth-grader at Mountain View Elementary School in Prescott Valley, rides a merry-go-round designed to keep riders from falling off. 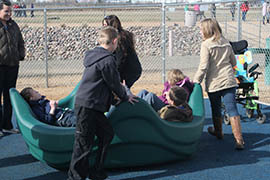 The ride is part of a new grant-funded inclusive playground.